These Personal Anti-Gravitic Transport Sketches are two-foot wide, blue-grey metallic discs of various types. If you step upon the bottom disc and stand with feet four inches apart, the disc turns on glowing with pale-blue light. The outer ring rises up from the ground, bonds on a molecular level to the upper section, and the disc hovers. Then it flies in the air where you imagine. 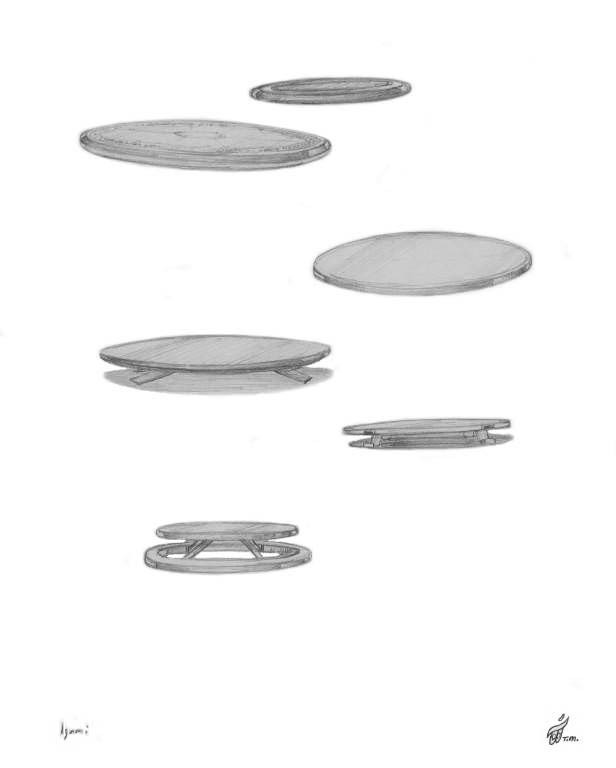 These Personal Anti-Gravitic Transport Sketches are disc shaped, made of a special blue-gray metal. Once the device is turned on, the feet are held in place by an anti-gravity force field that allows free movement of the legs and upper torso. The disc’s flight is guided by the imaginative in any direction through the air. You would discover that you can perform acrobatic loops, amazing turns, or fly at up to two hundred fifty miles-per-hour. A Personal Anti-Gravitic Transport is primarily used for reconnaissance or surveillance missions, and to get around in a thrilling way over shorter distances just for fun. In book one titled The Emerald Doorway (Three Mystic Crystals), Mayleena is knocked off a personal anti-gravitic transport by an almost extinct creature called a Sand Daringe. This normally gentle vegetarian creature lives in a parallel dimension of the physical universe on Earth, and it has been known to help drowning or injured individuals get to land. Its character is similar to Dolphins on Earth in this regard. Yet, it only acts in a very aggressive manner if its young are threatened, or it is startled while sleeping in its hidden lair beneath a sandy shoreline. Note: To see the Sand Daringe Attack Scene with Captain Kalem Starland, Mayleena, Master Ra Mu and of course the Sand Daringe click-on the link below.